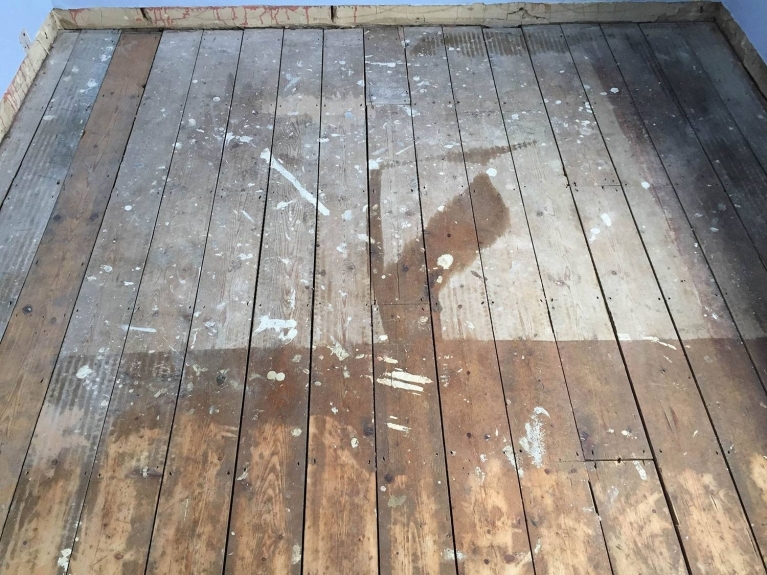 If you look at the before and after photos it’s hard to tell that it this is the same floor! 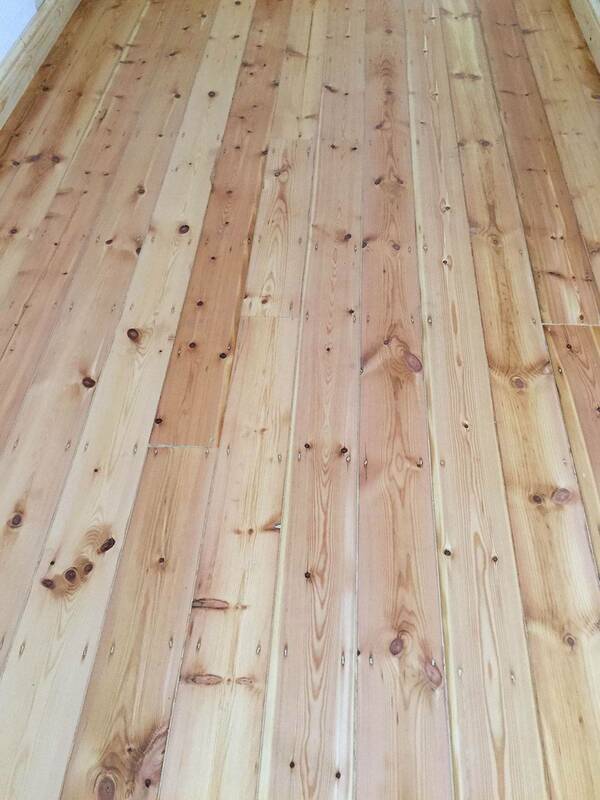 This fifty-year old pine floor consisted of boards nailed directly to joists and then lacquered. As the photo below shows, its surface condition had seriously deteriorated – although the planks were still fundamentally sound. Many nails were protruding from the floor, and the floor overall was fairly uneven and certainly not attractive. 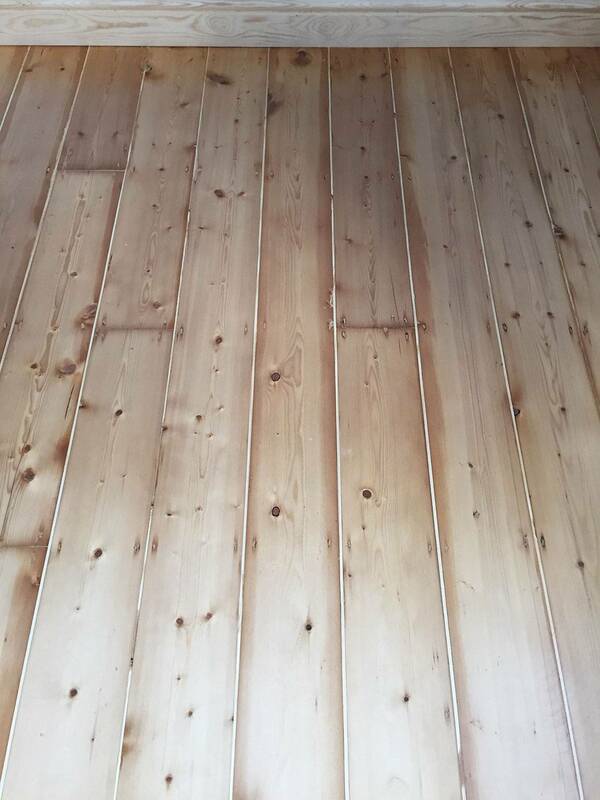 It was also very drafty due to gaps between the planks. 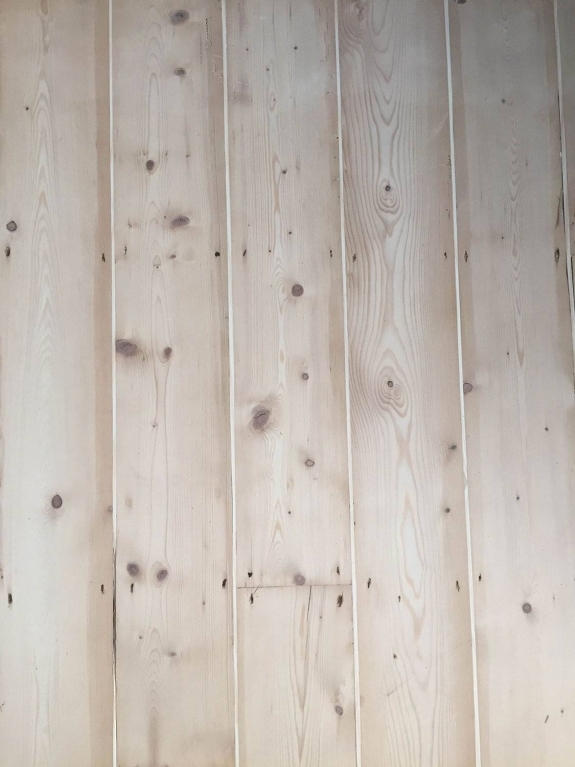 We were initially concerned that there could be an insect infestation, as the planks did in places show marks similar to those made by wood-eating bugs. However we were reassured to find that this was was very old damage (almost certainly dating back to when the pine boards were fresh) and these marks were all completely removed by sanding. Our first task was to hammer the nails down, one by one, using a special tool small enough to dig the nail in deeper without damaging the floor. We then filled what small holes and dents were left, leaving little – if any – signs of the nails at all, and certainly no risk of injury to bare feet. There were some gaps between the planks, so we took some spare pine floor boards from our showroom and cut these down into 4mm widths (or less) which were edged with PVA glue before being carefully and gently hammered in to fill the the gaps. The custom-made fillers not only made the floor more sound-proof, they also stopped drafts coming into the rooms from under the boards. The next job was to sand the excess wood off the top of these fillers, and then level out the whole floor. We had to use used a fairly rough grade of sanding paper to do this because of the generally uneven state of the floor. 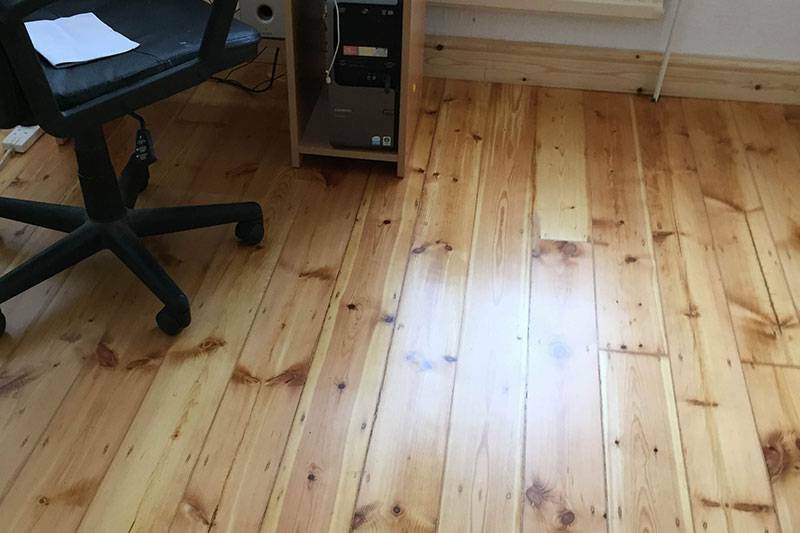 Finally, we applied hard wax oil to seal the floor. As you can see, the result was markedly different. In fact, the owner was so pleased with our work on the hallways and two downstairs rooms that we were then asked to sand the stairs of the property and apply hard wax oil there too to match. It took two people five days to complete this project.